A version of this article appeared December 26, 2012, on page A5 in the U.S. edition of The Wall Street Journal, with the headline: JFK Conspiracy Theorists Seek Inclusion in Ceremony. Washington, DC --- John Patrick Judge passed at the age of 66, just as he had lived -- with courage in the midst of pain. 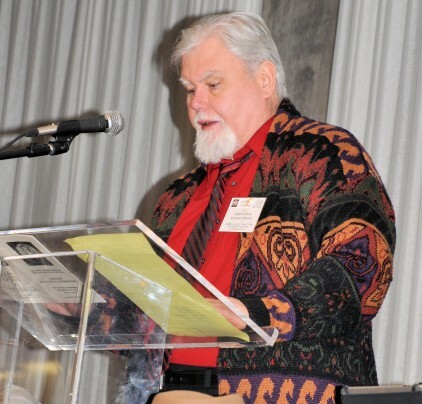 An internationally acclaimed researcher, writer and speaker, as well as a lifelong anti-militarist anti-racist activist, and community organizer, Judge died on April 15 due to complications from a stroke suffered in early March. Judge's primary areas of research were the assassinations of President John F. Kennedy, Robert Kennedy, Malcolm X and Dr. Martin Luther King, Jr., as well as totally unique research which he conducted on-the-ground about the massacre in Jonestown, Guyana. 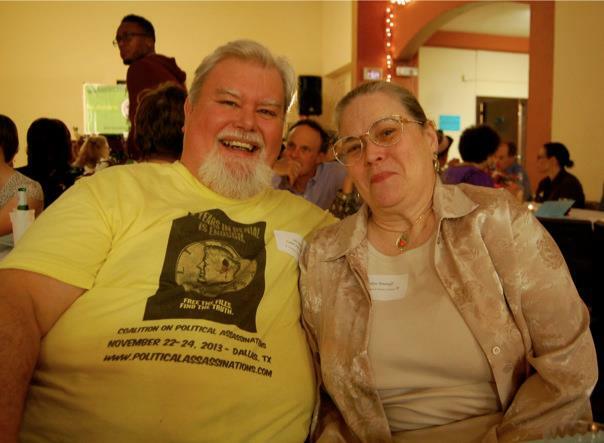 He is a co-founder of the Coalition on Political Assassinations (COPA), and organized COPA's annual conference in Dallas. The 2013 COPA conference drew more than 300 researchers and activists to Dallas on the 50th anniversary of John Kennedy's death. Amidst the national furor when the feature film "JFK" came out in 1992, Judge was one of the key public proponents behind the creation of the Assassination Records Review Board. One of his last efforts was to press for release of some of the thousands of Kennedy and Martin Luther King, Jr. assassination records still kept classified by the CIA and the FBI. Acclaimed nationally and internationally for his vast store of historical knowledge, Judge wrote: "Under the evil genius of Allen Dulles, whose espionage attacks on the Soviet Union date back to the 1920's, $200 million in Rockefeller and Mellon funds was directed into the hands of Hitler's spymaster Reinhard Gehlen and his 350 Nazi spies, who formed and founded our Central Intelligence Agency in 1947." John Judge is survived by his long-time companion and life partner, Marilyn Tenenoff and thousands of friends and admirers across the country and around the world. A celebration of his life will be held in late May. In lieu of flowers, tax-deductible donations can be made to support the preservation of Judge's books and archives in a new Museum of Hidden History, P.O. Box 772, Washington, DC, 20044. There's usually a nasty plot behind what seems so decent. It's often greed or selfish hate, in ancient times and recent. John Judge's aim is just to find the truth and then to show it. So we can change the world by letting all the people know it." “I tell people you can call me a conspiracy theorist if you call everyone else a coincidence theorist,” Mr. Judge, who died at 66, once remarked. John P. Judge, an independent researcher who tirelessly amassed and disseminated evidence supporting alternative explanations — some called them conspiracy theories — for President John F. Kennedy’s assassination, the 9/11 terrorist attacks and other historic events, died April 15 at a nursing facility in the District. He was 66. 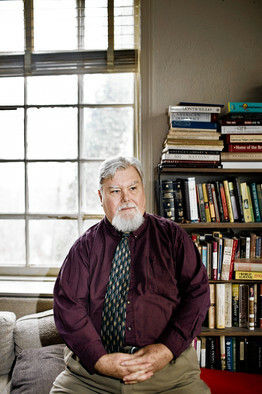 Through years of investigation and activism, Mr. Judge developed a devoted following in the community of skeptics who question official or commonly accepted narratives of the past. He co-founded and directed the Coalition on Political Assassinations, an organization whose activities include investigating the deaths in the 1960s of John Kennedy, his brother Robert F. Kennedy, civil rights leader Martin Luther King Jr. and black nationalist leader Malcolm X. News outlets, with some frequency, featured Mr. Judge and his work. “I tell people you can call me a conspiracy theorist if you call everyone else a coincidence theorist,” Mr. Judge quipped to the publication National Journal. His most noted work involved President Kennedy’s death in Dallas on Nov. 22, 1963. Like legions of others doubters labeled conspiracy theorists, Mr. Judge rejected the Warren Commission’s finding that Lee Harvey Oswald had been the lone gunman. Mr. Judge helped organize in Dallas annual commemorations of Kennedy’s death. He and others gathered on the grassy knoll, the spot where another gunman, according to some theories, was stationed. Those memorials became the subject of controversy last year, when Dallas marked the 50th anniversary of Kennedy’s death. After contentious discussions with event organizers, the Coalition on Political Assassinations agreed to hold its ceremony in a parking lot several blocks away from the usual spot, which was restricted to ticket-holding participants. In his work regarding more recent history, Mr. Judge cofounded the 9/11 Citizens Watch to monitor the operations of the official 9/11 Commission, the independent and bipartisan body created by congressional legislation to prepare a full account of the attacks. He briefly worked as an assistant to then-U.S. Rep. Cynthia McKinney (D-Ga.), who was widely rebuked when she suggested that President George W. Bush’s administration might have had advance notice of the terrorist strike. Former congressman Dennis J. Kucinich (D-Ohio), who met Mr. Judge during his Capitol Hill employment, described him as “brilliant” and said he had been “very impressed” by Mr. Judge’s research abilities. John Patrick Judge was born Dec. 14, 1947, in the District, and he grew up in Falls Church, Va. Both his parents worked at the Pentagon. Mr. Judge graduated in 1970 from the University of Dayton in Ohio, where he studied theology and where he recalled being obliged to participate in the Reserve Officers’ Training Corps. He later joined the American Friends Service Committee as a draft counselor during the Vietnam War. In the District, Mr. Judge became what the Washington City Paper described as “the voice of military dissent in D.C. public schools.” He sought to counter military recruiting efforts by attending career days and informing students of what he alleged were discrimination and deprivation of rights within the military. Mr. Judge’s survivors include his companion of four years, Marilyn Tenenoff of York Haven, Pa. She said that Mr. Judge had a stroke in March but that the cause of death had not been determined. The D.C. medical examiner’s office had not ruled on the case, according to a spokesman. Tenenoff said she plans to request an outside review of the autopsy report, when it is available, to assuage the concerns of anyone who may doubt its accuracy. "If the organizing principle is that the government lies, but there's no organizing principle to how you get to the truth, then anything is possibly the truth. People will organize around disinformation just as easily as information. The way covert operations do effective disinformation is they give the truth to the people who are discredited and they give the lie to the people who have great credibility - the way they disinform from both ends and confuse people. They put out stories - as we know from the assassinations - that will lead us down false paths, that will lead us to false sponsorships." "Families of victims and others who work at the airlines, as well as many witnesses I have spoken to, are offended and shocked by these unfounded speculations. Those willing to do a modicum of investigative work here in DC will be quickly disabused of this disinformation. "There are many legitimate unanswered questions about the events of September 11, 2001, its sponsorship, and the official version of events. We benefit from serious research and the issues raised by victim's families seeking accountability. Not the least of these is the apparent lack of standard FAA/NORAD response to these emergency events. Rather than use our time proving and belaboring the obvious, or focusing on areas of total speculation that can only hurt our public credibility, I encourage serious researchers to focus on the historical context of the event, the alleged conspirators, the funding, and the government response or lack of it." They have spent $13 trillion tax dollars since the end of WWII on this military/intelligence complex, and it cannot protect its own headquarters? It can track every electronic communication on earth, crack the codes of the Al Quaeda in advance of 9-11, locate bin Laden's cell phone, but it can't decipher what it all means? And beyond that question is the more pertinent one hardly anyone is asking. * Bush clearly and undeniably had advance knowledge of a terrorist attack on US soil using planes as weapons by 9:05 am on September 11. * NORAD had it by 8:45 in an unprecedented simultaneous hijacking of four planes. * The Pentagon had it, as did everyone in DC by 9:05 as well. * The Pentagon began to evacuate the building, as did the White House and Capitol. * EVERYONE had advance knowledge of Flight 77 coming towards DC for 40 minutes.Yet, there was a complete defensive stand-down. Interceptors from distant Langley AFB took off late and flew at subsonic speeds to arrive 5 minutes too late. Planes from nearby Anacostia Naval Air Station, Andrews Air Force Base, and the 73rd Air Wing at Atlantic City, NJ never took off. Scramblers in the air already at 9:05 from Otis AFB turned to target Flight 77 and were called off, despite a formal shoot-down order from Bush/Cheney "moments after" the 9:05 crash -- which had ended any speculation of accident or coincidence or hijacking motives. By that moment they undeniably knew in advance what was coming and where it was headed. Local news announced that DC was the destination. Surface-to-air missiles at the White House and Pentagon remained sheathed in their silos. Despite the planes having turned off communications with ground control towers and their identifying transponders (which also shuts off their own near-range radar screens to avoid mid-air collisions), they were clearly visible to all external radars, they were being tracked by NORAD and DC towers, and they were somehow being navigated directly to their target. How were they allowed to come into the most restricted air space in the world with no challenge or defense? That is the question that answers both when Bush knew in advance and begs any rational response. The White House and Pentagon officials have been lying since day one about both advance intelligence knowledge that could have foiled the operation, and about their own ability to prevent, at least, the attack on the Pentagon. Let them answer that. I suggest you ask any pilot that has flown one what it takes to bank into a building at 550 miles an hour, or to dive in a 270 degree turn from 5000 feet to fly so low that streetlamps are clipped off, into a building. There are two options: Military or experienced civilian pilots (many are military anyway) piloted these planes. The planes were flown on remote control. Much of all four planes were pulverized at the site, but identifying pieces were doubtless found in all the wreckage, including black boxes. None of that forensic evidence was released to the public, but that does not mean it was not found by the FBI and other agencies that worked in the debris of each site. ... My friend identified parts of the Boeing 757 that hit the Pentagon not by serial number but just by eyesight and familiarity with parts, shapes, colors and upholstery patterns when she was inside the crash site. She has no reason to lie, she lost her best friend and the rest of her regular crew, she worked for AA as an attendant and took that same route in those same planes several times a week. If we stick on proving a falsity it will discredit all else we try to establish. The question is not what hit the Pentagon, it is how Flight 77 could have. There is no question that Flight 77 hit the Pentagon. Remaining agnostic on this point also gives ammunition to the perpetrators of the stand-down and serves to discredit the other good work that continues to be done about the reality of what happened that day. It is my feeling that this thesis was actually part of an intentional disinformation campaign that spreads red herrings to discredit the real findings. "These conspiracy theorists will believe anything" say our detractors. Let's discover and present the hard facts and force the coincidence theorists to come up with plausible explanations instead of spewing out speculations we cannot back up and leaving ourselves on the defensive. 1. NORAD and FAA knew of the multiple hijackings in progress by 8:25 am. Bush and Cheney agreed on issuing a shoot-down order against two planes still in attack mode after 9:05 am, when everyone in the country knew what the nature of the threat was. No such orders were conveyed to pilots or carried out if they were. 2. Standard hijack intercept procedures were not followed by NORAD or military ready-alert scrambler planes. 3. Virtually no defense of any kind was made inside the most restricted air space in the US, the P-56 area around DC and the Pentagon despite the presence of combat ready aircraft at local bases. Nor were other defense measures, including surface-to-air missiles at the White House and Pentagon deployed. There was a stand-down on 9/11. 4. Planes scrambled to intercept were sent long after the threat was known, so that they arrived too late to stop the attack. There were at least two cases of this: Otis AFB fighters who turned and targeted Flight 77 after reaching NYC too late, and Pomona NJ AFB combat planes on military exercises heading into NYC after 8:45 am, were called back to base or off the pursuit. There are additional indicators that many combat-ready planes and units were disarmed and called down shortly before 9/11. 5. Chemical and DNA analysis and weaponization traits of the anthrax mailed out to media and Democratic opponents of Bush clearly linked it to both a DIA project to develop "the next generation of anthrax weapon" and to the gates of Fr. Detrich, MD, a center for CBW research since the 1950s run by military intelligence. On the morning of September 11, 2001 I was at home in Washington, DC, about half a mile from the Pentagon, in Anacostia. I had been called by a friend to inform me of the first plane hitting the WTC tower in New York City. He sits on a transportation board for the county in Fairfax, Virginia, which includes Dulles Airport. He was immediately alarmed because he knew that no commercial flights come close to those buildings on their normal routes, and he suspected this was a terrorist attack. As we spoke, the second plane hit the second WTC tower at approximately 9:05 am, and at that point people across the United States were forced to agree with his thesis, since neither accident nor coincidence would have explained two such tragedies happening nearly simultaneously. At that point, other planes that had gone off course and turned off communications with their control towers were still in the air. All four planes involved in the attacks had been identified as emergencies and potential hijackings by the FAA, NORAD, the National Military Command Center at the Pentagon, the Secret Service and other agencies linked into a phone bridge that was in place by at least 8:24 am, sharing critical information with the air traffic controllers and eventually with military pilots. By 8:18 am, according to published reports, they were aware of four commercial passenger planes off course and not responding normally, two from United and two from American Airlines. American Airlines (AA) Flight 77 left Dulles airport that morning on its regular route to LAX airport in Los Angeles. For a few minutes it was lost to radar tracking when it turned off course and headed back to the east. But in a short time radar contact was renewed and its course was visible. It was coming towards Washington, DC. Much of the city is under P-56, one of the most secure airspaces in the world, protected under federal regulations from any over-flight by unauthorized planes, private or commercial, and guarded by fighter jets from Andrews Air Force Base (AFB) and Anacostia Naval Air Station, where the Air National Guard is located. Not only did authorities know it was headed to DC, it was announced publicly on local TV and radio stations, and evacuation was ordered at the White House, the Capitol, the Pentagon and other federal buildings. This notice was given well in advance of the plane's arrival in DC airspace. I stood watching television news reports that morning, anticipating its arrival. A large explosion at approximately 9:43 am shook my windows, though it was not visible to me. When newscasters announced the identity of the plane involved, American Airlines Flight 77 and its Dulles/LAX route, my heart sank. A dear friend and fellow researcher had been working as a flight attendant for American for many years, and that was her regular route, several times a week. I feared she had been trapped on the plane and died in the crash. Attempts to reach her by phone that day got her answering machine, nothing more. Local reporters continued to cover the event on radio and TV. There was footage of the rescue and fire crews at the Pentagon site, and the smoke plume was visible across the city. Hundreds of witnesses had been stuck in traffic during the attack along major highway routes into the city that border the Pentagon, and had seen and heard the event close-up, as well as office workers in nearby buildings, others along the route who were outside and ducked because the plane was flying so low, and workers at the Pentagon site, both at the heliport and in the construction crews who had been reinforcing the building walls for several years. Many of these people were interviewed by local and national media and the press. "Continuity of Government" was declared, bypassing Constitutional governing structures in favor of a small number of executive and legislative leaders working together with FEMA, the National Security Council and the Pentagon from a secure bunker in Bluemont, VA to function in the emergency. Metro, AMTRAK trains, and commercial flights were cancelled and government employees were excused from work and told to go home. Local highways became one-way routes out of town. Park Police could be seen on the streets with machine guns at ready. DC came very close to martial law. And all day long, local witnesses to the event at the Pentagon were interviewed, describing the plane and its collision with the Pentagon and the explosion that resulted. Later, survivors from inside the building were interviewed, along with rescue crew. A massive rescue and clean-up operation began once the fire was contained. My attendant friend knows and has put me in touch with other American Airline employees and pilots who were at the site and took photographs. We are busy locating these, as well as another attendant who was at the site with her that day. 9/11 CitizensWatch has also been pushing for public release of all photographic evidence relating to the Pentagon attack from federal agencies and other sources and plans to file a Freedom of Information request to get records from all federal agencies that might hold them. There are many legitimate unanswered questions about the events of September 11, 2001, its sponsorship, and the official version of events. We benefit from serious research and the issues raised by victim's families seeking accountability. Not the least of these is the apparent lack of standard FAA/NORAD response to these emergency events. Rather than use our time proving and belaboring the obvious, or focusing on areas of total speculation that can only hurt our public credibility, I encourage serious researchers to focus on the historical context of the event, the alleged conspirators, the funding, and the government response or lack of it. American Airlines Flight 77 hit the Pentagon, killing passengers and crew, along with construction workers and a small number of Pentagon employees. It made an amazing spiraling descent, curving 270-degrees around the open area, and then flew dangerously close to the ground, skidding into the ground floor of the Pentagon. A huge fireball could be seen outside the building as it hit. Employees inside the building were also burned by jet fuel, which covered the lawn and front of the building. One employee saw the nose of the plane crash through her office wall. Pilots have disagreed about the piloting skills necessary to carry out this maneuver in a large commercial plane. Questions about the actual events remain but I hope that credible witnesses and the existing evidence will at least put to rest the wild speculation that have replaced Flight 77 with flights of fancy.